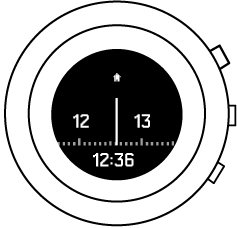 You can use Suunto Kailash to keep track of three different times: local time, home time, and world time. Local time is time at your current location. See Local time. Home time is the time at your primary residence, which you can define with the home location setting. See Home time. World time is the time at a location of your choice, such as a second office or your favorite vacation spot. See World time. Local or main time is the time at your present location. It is automatically set and continually updated as long as GPS time and DST are on. If you set local time manually, it is still updated automatically unless you turn GPS time off (see GPS time). You can adjust local time manually in the options menu under TIME & DATE » Time & date. Home time is a second, optional time that you can keep track of once you have set your home location (see Home location). Home time is kept up to date based on GPS time and DST. Home time is shown in the timeline display when your home time differs from your main time, for example, when you are traveling. Press the lower button to change views and see your home time. World time is an optional time setting you can use, for example, to keep track of the time at a second international office. It can be any major city in the world. Long press the middle button to enter the options menu. Press lower button to scroll to TIME & DATE and select with middle button. Press lower button to scroll to World time and select with middle button. Set World time to On with the 7R button. Scroll with the lower button through the continent list and Select a Continent with the middle button. Repeat with Country then City. Additional information is shown in the views at the bottom of the main time display. Cycle through the views by pressing the lower button. The default views are battery, altitude, sunrise/sunset, step counter, seconds and date. Most of these views are optional and can be turned off if desired in the options menu under GENERAL » Views. Sunrise and sunset times are based on your current location. These are available as a view in the timeline display and can be turned on/off in the options menu under GENERAL » Views. The date in the timeline display is based on your current location. You can turn this view on/off under GENERAL » Views. The date is updated automatically if GPS time is on. You can manually change the date in the options menu under TIME & DATE » Time & date. GPS time can be used to keep your time(s) up to date. 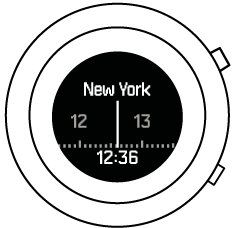 When you travel to a new time zone, the watch automatically checks and updates your time(s) accordingly. GPS time is on by default. You can turn it off in the options menu under TIME & DATE » Time & date. You can adjust the DST setting under TIME & DATE » Time & date. Note that the setting is only visible if GPS time is on.